The DP25B process meter accepts a wide variety of DC voltage and current inputs to cover any typical process application. Standard features include a full 4-digit three color (Red, Green, & Amber) programmable LED display, easy front panel scaling to virtually any engineering units, selectable excitation of four voltages to work with most transducers and transmitters, front panel and remote tare function for weighing applications, and a hardware lockout to prevent unauthorized changes in setup. 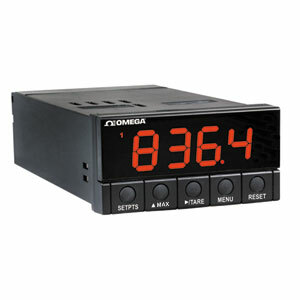 The meter also has the ability to change display brightness from high, medium and low. Four full digits and simplified scaling via the front-panel pushbuttons make it easy to set the display to read in any engineering units. All these standard features add up to an instrument with powerful capabilities at an extremely affordable price. 참고: Power Options are not field installable. All units come complete with a operator’s manual.